The era of job boards is over. Recruiters in the modern talent market need to attract passive, not just active, job candidates in order to find and retain the best hires. 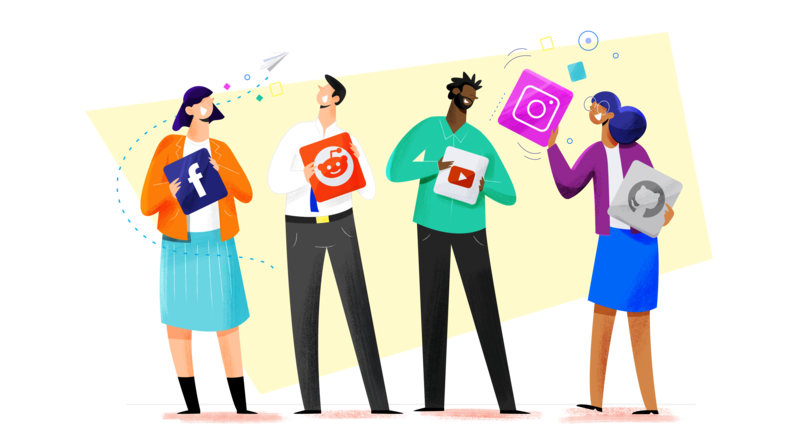 For most modern HR teams, a crucial part of passive candidate attraction revolves around the use of platforms like Facebook, LinkedIn, Twitter, YouTube, and any other social media site you care to mention. Why? Because these are the places where virtually all job candidates—passive and active alike—already spend their time. Thus, your next hire could easily encounter your employer brand messaging on a platform like Snapchat, taking the first step on the candidate journey before submitting an application at your company. For recruiters, the trick is to understand the importance of these new employer branding venues and find a way to turn them into a competitive advantage in the war for talent—hopefully some of these stats will help you to do just that. The proportion of businesses who are targeting smartphone users with mobile-friendly recruitment content. We said above that social media usage was already catching on among recruitment marketers; this may have left you wondering how, exactly, you’re supposed to turn social media to your advantage if everyone is already using it. Well, one option is to focus your attention on mobile. While only a third of companies are tailoring their employer brands to smartphone users, you can rest assured that a much larger percentage of social media users are browsing newsfeeds and sending Snaps from their iPhones. Thus, by actively cultivating a mobile-friendly employer brand presence—including not just mobile-friendly content but mobile-friendly landing pages and even job applications—you can get the attention of passive job seekers who might otherwise be put off by a smartphone-unfriendly applicant experience. The proportion of businesses using social media for talent acquisition who rate reaching passive job seekers as their top reason. What this stat means is, essentially, that there's the beginning of a consensus in the HR industry about the true value of social media platforms. Though it might seem paradoxical to go after people who aren’t searching for jobs, studies show that the vast majority of candidates—whether they’re looking for new employment or not—would happily change jobs if the right offer came along. The trick is making sure that your target personas learn to think of your offer as “the right offer.” That starts with a careful approach to recruitment advertising centered on establishing your business as an employer of choice within your industry. The percentage of American social media users aged 18-44 who follow at least one brand. This stat is here for one reason: to dispel the (erroneous) notion that social media users don’t want to hear from brands. In fact, it’s quite the opposite, especially for younger users. This obviously varies platform to platform, with most or all LinkedIn users actively seeking out connections with businesses and relatively few Snapchat users doing the same. But the point stands that social media is increasingly becoming a means of facilitating connections of all sorts—not just interpersonal ones. Modern job seekers turn to Facebook and Twitter to research companies to which they’re considering applying, and what they find there can have a real impact on their ultimate decision. By promoting your employer brand actively and conscientiously on these channels, you can make sure that you’re relatively in charge of the narrative that people associate with your company as a place of employment. Nature abhors a vacuum, and job seekers will draw conclusions from social media regardless of whether you prioritize it. The number of recruiters using LinkedIn, compared to just 55% using Facebook—despite the huge difference in their usership numbers. Although LinkedIn is the top social media site that’s designed explicitly for professional networking, it may not actually be the best choice for employer branding purposes. Why? Because when passive job seekers are off the clock they’re not likely to spend much of their time there. On the contrary, they’re going to spend time on sites like Facebook where the content is more engaging from a non-business perspective. But guess what? There’s no reason your content can’t be engaging and add value for these users, all while telling the world all about your company and what makes it such a special place to work. The proportion of job seekers who rate themselves less likely to purchase goods from an employer who provided a poor applicant experience. Let that sink in for a second. When applicants don’t feel that they’ve been treated well, not only will they not work for you—they’ll go one step further and stop using your product. This might seem like an odd statistic for a post about social media, but it’s crucial to remember that things like mobile-friendly content (which we mentioned above) are a part of the applicant experience you provide. If you’re using sites like Facebook to tell a story about the passion behind your products and highlight the work your team does, that’s great. But make sure you’re also tending the human side of the equation by making your branding efforts part of a broader discussion, ideally while fostering (and investing in) a sense of community within and without your organization. The increase in candidate quality seen by some recruiters as a result of social media marketing efforts. We’ve outlined a lot of opportunities to find a competitive advantage through social media in the preceding 1,000 words, but some of what we’ve described might seem a little too labor intensive. Well, let this final statistic remind you why it’s worth dedicating time and resources to social media: more, better candidates. Sure, your business might be able to get by on traditional recruitment methods that only target active job candidates, but too much of the talent worth fighting for exists outside of the 20% of the talent market that’s actively job hunting at any time. If you want to find candidates that are good, not just good enough, social media will likely be an important part of your applicant attraction strategy.